Sirius and Procyon as of 9 p.m. local time in late April and early May from mid-northern latitudes. A couple of weeks ago we looked at members of the cat family in the evening spring sky. So this week, to give equal time to dog lovers, we'll examine some of the star patterns that are dedicated to dogs. In our current evening sky, there are four canines in view as darkness falls. In one of these, shines the brightest of all stars. You can see it blazing prominently low in the southwest. 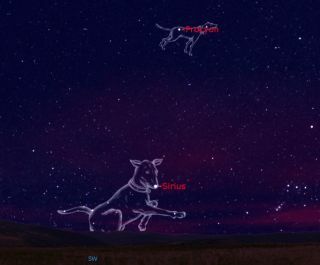 Sirius, the "Dog Star," is the brightest star of the constellation which bears the Latin name Canis Major -- the Greater Dog. It is also the unquestionable ruler in its own section of the sky; a truly dazzling object. At a distance of 8.7 light-years, Sirius is the fifth nearest star known. Among the naked-eye stars it is the nearest of all, with the exception of Alpha Centauri. Its color appears a brilliant white tinged with a distinctive bluish hue. An admirer of Sirius once compared its sparkle to that of a brilliant diamond. Its name appears to be derived directly from the Greek word for "sparkling" or "scorching," and one can understand how it received these titles upon seeing as it approaches its setting, which occurs nowadays at around 10:00 p.m. local daylight time. When at such a low altitude, the thicker layer of air near to the horizon causes its light to scintillate rapidly, causing it to seem to flicker with all the colors of the rainbow. Ironically, this is when Sirius seems to attract the most attention; people call their local planetariums inquiring about "that strange and colorful UFO that was dancing above the west-south horizon." The rest of the stars of Canis Major, with some imagination, can be made out to somewhat resemble a dog. In his classic sky guide, "The Stars/A New Way to See Them," the late H.A. Rey (1898-1977) used Sirius for a dog tag. The antithesis of the complex pattern of the Big Dog can be found in Canis Minor, the Little Dog. It is composed of just two stars (perhaps instead of the Little Dog, we should call it the "Hot Dog!"). The brighter of these two stars is the "little Dog Star," known as Procyon, the eighth brightest star in the sky. It is a yellow-white star, six times as luminous as the Sun. The name Procyon has been in use since the days of ancient Greece. It is the equivalent of the Latin word "Antecanis" or "Before the Dog," an allusion to the fact that Procyon rises about 20 minutes before Sirius (at midnorthern latitudes), and thus heralds the appearance of the great Dog Star. Lastly, now soaring high in our eastern evening sky are the Hunting Dogs, known as Canes Venatici. Located about a third of the way from the end of the Big Dipper's handle and below it, these dogs were placed in the sky to assist Boö tes, the Bear Driver in his daily task of pursuing the Big Bear (Ursa Major) around the pole of the heavens. Like Canis Minor, there are only two stars that mark the Hunting Dogs, the brightest of which is Cor Caroli, known as "the Heart of Charles." A popular story is that the star was so-named by Edmund Halley in honor of King Charles II of England. This was supposedly done at the suggestion of the court physician Sir Charles Scarborough, who claimed that " . . . it shone with a special brilliance on the eve of the King's return to London on May 29, 1660." However, upon delving deeper into this star's history, it is found that this star's original name was "Cor Caroli Regis Martyris" honoring the executed Charles I.
Cor Caroli marks the position of "Chara," one of the two hunting dogs in the mythological outline of the constellation. The other dog is named "Asterion" and is marked by another, fainter star. In this region of the sky are several interesting deep-sky objects, which are all worth looking for with a telescope. One of these is Messier 3, a beautiful, bright and condensed globular star cluster. It was discovered by Charles Messier in 1764 and can be seen as a hazy sixth-magnitude "star" in binoculars (Sixth magnitude is on the limit of naked-eye visibility). There are also three faint galaxies in this region of the sky, located between Canes Venatici and the Big Dipper's handle. Just to the north and forming an isosceles triangle with the dogs two stars is Messier 94, a very compact spiral galaxy. Photographs of M94, which is about 20 million miles away, strongly resemble a hurricane that lacks an eye. Messier 63, about 35 million light-years distant, appears nearly twice the size of M94. Photos show a very narrow pattern of spiral arms resembling some vast celestial flower. For this reason this galaxy has received the popular name Sunflower, though in a modest telescope it appears only as an oval haze. Nearby is Messier 51, the famous Whirlpool Galaxy, 35 million light-years away, was the first observed nebula in which a spiral structure was observed, in 1845, by Lord Rosse with his giant six-foot reflector at Parsonstown, Ireland. A small telescope shows it as a pair of hazy spots; each one the center of two connected galaxies.